Transparency Market Research states that Hewlett Packard Enterprise, Cisco Systems Inc., Juniper Networks, Arista Networks, and Brocade Communication Systems Inc. were the leading players in the global data center networking market for 2015, amid a highly competitive landscape. The growing demand for virtualized systems, servers, and data centers across all economies is keeping the competition raised to a high level, and is likely to continue doing so for the coming years. The prominent players in the global data center networking market are also known to show a high level of efforts in the discovery of high profitable locations in emerging economies. As per the research report released by TMR, the players in the global data center networking market are expected to offer a very diverse range of solutions to their clients, in addition to producing greater investments in technology innovation, which forms the foundation trend in the market. Mergers and acquisitions are also expected to play an important part in the shaping of the global data center networking market over the coming years. The global data center networking market is expected to rise to US$228.40 bn by the end of 2025, after expanding at a whopping CAGR of 15.5% within a forecast period from 2016 to 2025. The market was valued at US$63.05 bn at the end of 2016. “The current positive force behind the global data center networking market is largely created by the growing uptake by end users, of virtual data centers and cloud computing tools. Organizations across the world are showing a high level of awareness regarding the advantages of real-time communications and the speed and cost-efficiency of virtual data centers, and this alone is enough of a motivating factor for players in the global data center networking market to look at greater opportunities in all regions,” states a TMR analyst. 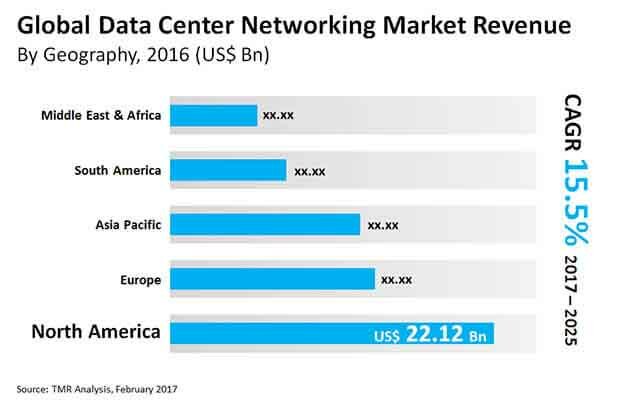 The global data center networking market is also expected to show a higher demand scale over the coming years, thanks to the specially increasing rate of implementation in emerging economies, due to increasing levels of awareness of the advantages that modern data center networking strategies can bring to the table. North America has been leading the global data center networking market so far, and is highly likely to continue doing so over the coming years, thanks to an advanced IT industry and infrastructure, followed by a high density of the most prominent players in the market. Asia Pacific, on the other hand, is expected to show a remarkable 17.3% CAGR in the global data center networking market from 2016 to 2025, owing to a booming networking industry and rapidly advancing infrastructure and its consequently advanced communication needs. Despite the numerous advantages of the global data center networking market that are propelling its players towards a brighter future, the market is still being restricted by the problem of uncertain data protection laws. When it comes to data protection services that need to watch over data that falls under the jurisdiction of another region away from them, there arise several problems in the execution of all data protection services. As a result, it becomes difficult for end users to avail data protection services of companies from other regions. “The setup of new data center networking solutions in the emerging economies is where all the more prominent players in the global data center networking market are looking at. The scope of growth for the market in Asia Pacific at the moment is extremely high, and most players are trying to gain a piece of the pie,” adds the analyst.